Do you need a complete West Linn roof replacement? West Coast Roofing specializes in roof replacement for West Linn area homes and we can help you with every aspect of your West Linn roof replacement. Storm damage in West Linn is common, and a small leak on your roof doesn’t always mean that you need a complete roof replacement. However, if the damage to your roof is severe, or if your roof is very old, it may make the most financial sense to have a complete roof replacement for your West Linn area home. 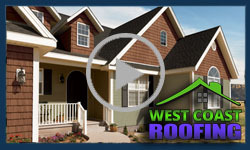 Our experts at West Coast Roofing specialize in West Linn roof replacements and have extensive experience in evaluating roofs in all conditions. Our professionals can assess the damage to your West Linn area roof and help you determine if roof replacement is the best option for your home or business. Nobody in West Linn wants the financial expense of a complete roof replacement. You can trust that West Coast Roofing will only recommend a West Linn roof replacement when it is absolutely necessary. We will help you understand the condition of your roof, present you with all of your options, and help you make the roof replacement or repair decision that is right for your West Linn area home. The age of the roof on your West Linn area home. If your roof is nearing the end of its life, a complete West Linn roof replacement may be the best financial choice. If your roof has been repaired in the past or has multiple layers of shingles, a complete roof replacement may be necessary due to building code restrictions in the West Linn area.. If the damage to your roof covers a large area, a complete roof replacement will give you more peace of mind and provide a longer-lasting solution for your West Linn area home. If aesthetics are particularly important to you, a West Linn roof replacement may be necessary to ensure that the colors and style of your roof remains uniform across your West Linn area roof. Is your West Linn area home in need of a roof replacement? Contact West Coast Roofing and we can help you understand your options and determine the best approach for your West Linn roof replacement project.